A movie theatre in New Rochelle, New York. A movie theater or movie theatre is a place where movies are shown on a big screen. People or "patrons" (the audience) watch movies, usually in chairs inside an auditorium. 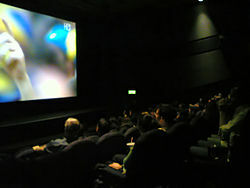 The movie is projected with a movie projector onto a large projection screen at the front of the auditorium while the dialogue, sounds and music are played through a number of wall-mounted speakers. A movie theatre is sometimes called a cinema. A theatre with multiple screens commonly is called a "multi-plex" or "mega-plex" (if more than 10 screens). Movie theatres have comfortable chairs. There are different types of formats of a movie theatre. The first movie theatre was opened to the public on April 23, 1896, in Koster and Bial's Music Hall on 34th Street in New York City. The oldest movie theatre in the world, which is still in action today is the Kino Pionier (opened 1907) in Szczecin, Poland. Movie theatres make money from not only movie tickets but from concessions which sell food and drinks (popcorn, candy, soft drinks, etc.). In recent years with the increase of movie rental costs, theatres have become more and more creative about how they make money. New theatres being built include restaurants, party rooms, conference rooms, arcades and more. This page was last changed on 23 October 2018, at 20:00.